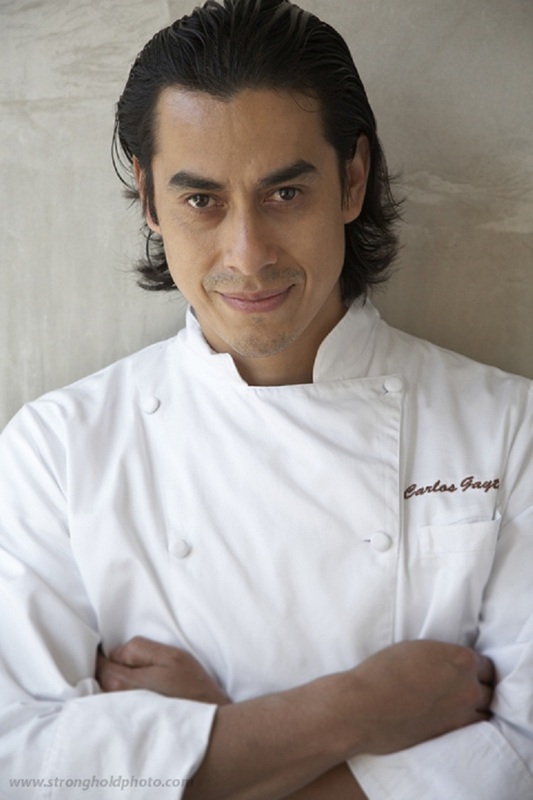 Chef Carlos Gaytan’s culinary journey has been one of hard work, persistence and dedication. Having arrived in Chicago in early 1991, he began a career at Sheraton North Shore Hotel, quickly working his way up to pantry cook, line cook and banquet cook during his first year of employment. He earned a position as a Chef Garde Manger and discovered he possessed a highly artistic and creative ability to carve on ice, fruit and vegetables. He participated in many food and ice carving competitions- winning several awards. Having perfected his skills in handling both hot and cold foods for over six years, he began his employment as Chef Garde Manger at the Union League Club of Chicago in 1996. For over seven years he worked under the guidance of Chef Michael Garbin. He honed his ability to cook a wide variety of foods and ultimately became the Banquet Sous Chef. The Union League Club has ranked as the second best private club in the nation and it became the place where Chef Carlos Gaytan gained the additional knowledge he needed to lead a successful career. In April of 2004 he was offered the position of Chef de Cuisine at Bistrot Margot where he worked tirelessly and passionately at creating the art of food. Over the years, he has worked with renowned French Chef Dominique Tougne and has participated in such events as the Confrerie de la Chaide de Rotisseurs, the Moet and Chandon Brunch and the Annual Flora Springs Dinner Auction in Napa Valley. Today, Chef Carlos Gaytan is thankful, as he was able to see his dream become a reality in May of 2008 by opening his own restaurant Mexique on Chicago Avenue in Chicago. With great creativity, love and dedication he applies his knowledge of French cooking techniques and ingredients to his roots of traditional Mexican cuisine creating a revolution of Mexican gastronomy. Mexique has received much recognition since its opening. Within the first three months CS Magazine recognized Mexique as one the best restaurants in Chicago. Mexique was named one of the top new restaurants of 2009 and best restaurant in 2010 by Chicago Magazine. In 2011 Chef Carlos received the American Culinary Federation Windy City Chapter Chef of the Year Award for his extraordinary achievements. Mexique has had the honor of participating in Chicago Gourmet for the last three years and Chef Carlos was chosen as one of five Celebrity Chefs in the 2012 Taste of Chicago. Chef Carlos has also shared his love and knowledge for cooking as professor of Regional Mexican Cuisine at Kendall College Culinary School. In 2013 Mexique received its highest honor yet by being a Michelin one star recipient. In 2013, Chef Carlos participated on the famous TV program Top Chef, arriving to the semifinal phase and is currently participating in Master Chef South Africa due in 2015. In 2014, Mexique received for another year, the Michelin one star. Congratulations Chef Carlos Gaytan on being our Chef of the Month for December! Your journey as a chef has inspired us! I am the Executive Chef and owner of Mexique Restaurant based in Chicago. I wanted to represent Mexican and French influences in my cuisine. I have been cooking since I was a little boy frying tacos on the street and loved it! I became very comfortable with it and wanted to pursue it as a career. Vitamix Blender. I can do many things with it like sorbets and purees. I do not have one but several…like pork belly and seafood. 6. What’s the strangest thing you ever ate? Escamoles – which is ant’s eggs. This is native to Mexico and is very good. It is interesting and does not have a lot of flavor. 7. Who would you most like to cook for? My family and 16 year old daughter. 8. Do you enjoy dining out on your free time? What is your favorite type of cuisine? I do and love very simple food like seafood. Comfort and soft fabrics. I like Egyptian cotton and short sleeves as well. I never went to cooking school. I have been in the business for 23 years and a chef for 10. Have to get the basics at the beginning. Work for different restaurants to get to know different styles and cuisines. They need to be professional and get to their job on time, look clean and be constantly learning. 13. What is your greatest challenge in getting the ingredients you need? I like to shop for ingredients and cook with what is available. I don’t experience much challenges. 14. Do you try to experience your competitors’ food? Do you ever get ideas from them? When I travel, I do and eat out a lot and get fresh ideas. 15. Do you think it is important to visit the markets rather than just have standard orders? Yes. It is very important because you can find ingredients you knew about or never worked with and try new dishes. 16. How do you test a new recipe without putting it on the permanent menu? From experience, I just put it together and go with the flow. 17. What is your advice for planning a menu for a new restaurant? Chefs should include seasonal ingredients all the time. They can get creative with what they have and do not necessarily have to buy expensive cookware and accessories. For instance, like a $5,000 steamer for example. As an alternative, I use a Mexican Tamale Steamer for $30 which would do the same thing. 19. What dining trends do you see taking place in 2014? Mexican cuisine is becoming a sought after food because of the big, bold flavors it provides. We try to cook healthy but you tend to sacrifice flavors and it is all about finding that balance. 21. What do you think of “Green Kitchens?” Is it realistic to outfit your kitchens to be environmentally friendly? Yes, Green Kitchens are great and possible. 22. How does Social Media play a role for Chefs today? A lot. We get a lot of business from social media and customers don’t forget about you but are constantly talking about you.